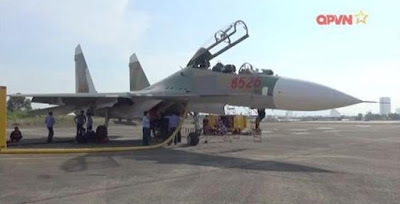 Defense website reported Russian VPK Vietnam will repair and upgrade the Su-27 fighters, Su-30 at the new plant in Danang. Day 3/6, VPK website of the Russian Defence published the article titled "Su 27/30: Vietnam will repair itself in the country". Accordingly, Vietnam is building capacity for maintenance, repair basic fighter Su-27 and Su-30, to escape from sending aircraft abroad. To implement this program, Vietnam has recently launched a defense plant in Danang A32. "The repair of domestic aircraft upgrades will significantly increase the operational readiness of fighters," the source said. According VPK, as of this moment, Vietnam Air Force was equipped with 12 injection and 4 consolation Su-27 fighter Su-30MK2V. In 5/2009, a new contract for the supply of 12 new aircraft manufactured by Russia was signed. Previously, the plant has sent tens A32 staff to overseas training. Currently, the plant has successfully yourself repair failures of modern fighters. Each workshop repairing a technical segment with over 10,000 different components requires careful, precise, meticulous very strict. Apakah Indonesia juga merencanakan memiliki kemampuan pemeliharaan Sukhoi yang dimilikinya secara lokal?